A hungry baby hedgehog recently got itself into a sticky, or rather a salty, situation when it stuck its nose into a discarded bag of chips. Or make that crisps, as the hedgehog had its unfortunate encounter with someone’s trash in Weston-super-Mare in England which is (as Care2′s Judy Molland tells me) a vacation spot with a pier and the SeaQuarium aquarium. Luckily, a shopkeeper heard rustling and found the hedgehog stuck in the bag within a railed-off area at the bottom of some steps. A total of six people, including workers who cut through the railings, joined together to set the little hedgehog free. A member of Prickles Hedgehog Rescue, Jules Bishop, crawled through the cut railings to reach the hedgehog who has since been named Crispian and is being housed at a Rescue Center in Somerset. He’s thriving now and will be here all winter as he’s so tiny. I want to thank all the people involved because obviously without their commitment and dedication this little hog would have had no way to survive. He was very, very cold and dehydrated when I emptied him out of the crisp packet. Hedgehogs’ natural diet consists of snails and insects including works beetles, grubs and caterpillars. As the Prickles Hedgehog Rescue site notes, hedgehogs hibernate when the temperature falls below 8 degrees Celsius (46.4 degrees Fahrenheit), usually in November. But they must reach a weight of 650 grams to survive hibernation and hedgehogs born in the late summer — “autumn juveniles” — struggle to make that weight. Indeed, Prickles Hedgehog Rescue says that people who find little hedgehogs foraging for food should bring them to a local rescue center to increase their chances for survival through the winter. 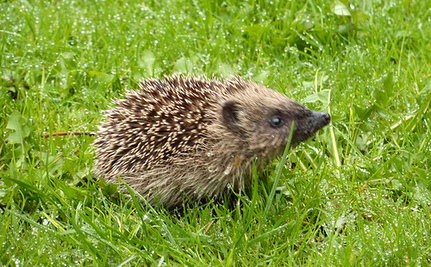 In the spring, when the weather is warmer and natural food sources in greater supply, the hedgehogs can be release back into the wild, near the area where they were found. The UK’s hedgehog population has fallen by 25 percent in the past ten years, according to the British Hedgehog Preservation Society and the People’s Trust for Endangered Species. Among the reasons for the decline in their numbers are “intensive farming, improved pastures and poorly managed hedges,” as well as a loss of green space in suburbia to car ports, patios and decks. Hedgehog Street has more information about helping hedgehogs while the Prickles Hedgehog Rescue offers some dos and don’ts for helping hedgehogs. Hope Crispian has a good winter at the Somerset shelter and can be back amid the bugs (and away from the plastic bags) once spring returns. I'm glad he got saved. Great story, thankfully a good ending for a hog. Wonderful rescue story - thanks for sharing. Hedgehogs are definitely one of the cutest animals in the world ..... SQUEEEEEEEEEEEE!!! Thanks to everyone who helped save this little hedgehog. Thanks to all that helped Crispian survive. Hegdehogs are survivors but sometimes need a human helping hand.